The Radcliffeborough neighborhood is an eclectic and lively area downtown with a refreshing mix of architectural styles, including plantation-style homes, Charleston Cottages, kitchen houses, and other vernacular architectural types. 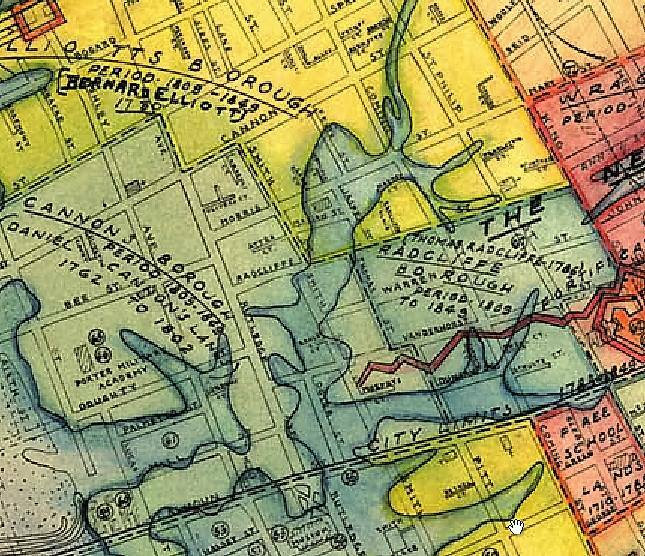 Originally comprising the eight-block area bounded by King, Vanderhorst, Smith and Radcliffe, the original land belonging to Thomas Radcliffe was joined by former Elliot Lands to the north and the western portion of the Wragg Lands to make up what we know as Radcliffeborough today. The original plat of farmland was purchased and surveyed by Thomas Radcliffe in 1786, but there are no remaining structures from that time period. Radcliffe was lost at sea in 1806 and his wife Lucretia along with his estate continued to develop the lands. She donated the four lots on which the Third Episcopal Church was built in 1811. 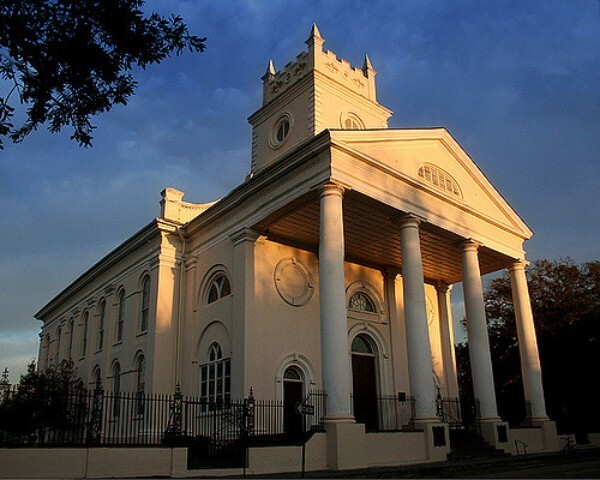 The Cathedral of St. Luke and St. Paul at 126 Coming Street is the largest Episcopal church edifice in SC. Photo by Micah A. Ponce via Filckr. At the turn of the 19th century, Charleston was enjoying a boom of growth and wealth from the success of crops and trade.The Church of St. Paul was designed by Scottish builders in a conscious attempt to build a larger edifice than the churches downtown. It was known as 'the planter's church' as it attracted many worshippers from plantations along the Neck outside of town, as well as those who had summer townhomes in the growing suburb. Early neighborhood residents also included wealthy merchants and mechanics whose stores and businesses were located nearby. Several free black families from before the Civil War, slaves living apart from their masters, and after the war, newly freed slaves also lived in Radcliffeborough. According to its Neighborhood Association, today's Radcliffeborough is as racially and economically mixed now as it was then. 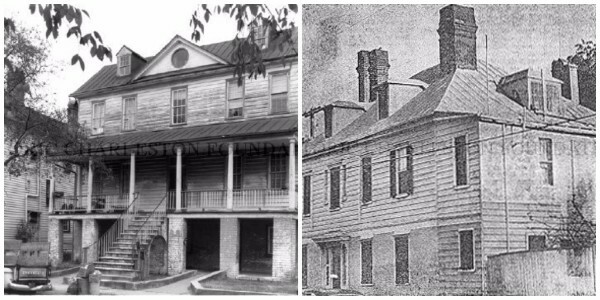 Early dwellings in Radcliffeborough include the plantation style house at 64 Warren Street (ca 1816, right before rehabilitation in 1980) and the "West Indian" style house at 57 Radcliffe Street (ca 1817, left, late 1960s). Photos from the Historic Charleston Foundation. The two oldest dwellings still standing in Radcliffeborough are believed to be the James Gabeau House at 64 Warren Street (above left) and the Shepherd-Wilson House at 57 Radcliffe Street (above right). James Gabaeu (1779-1820) was the eldest of nine children whose father was one of the last French Protestant colonizers. Wealthier than most Huguenot refugees during that time, James Gabeau was a copper (barrell builder) and one of the first to purchase a lot and build a substantial residence in the new suburb of Radcliffeborough. His plantation style home was built on high brick piers in 1816. Like many homes in the area, it was left to ruin in the 20th century. It was rehabilitated in the 1980s as part of the Historic Charleston Foundation's preservation efforts. The history of the Shepard-Wilson House, better known as the "West Indian House" is not as clear. The great-niece of Thomas Radcliffe, Sophia Perry Shepherd, received 57 Radcliffe upon her marriage to Alexander Barron Wilson in 1816 but it is unclear whether this house was already standing at the time. It is called the West Indian House because of its original T-shaped form with a steeped hip roof overhanging an inset piazza. The home originally faced open country and may have been part of farm or plantation. Walking through the streets of Radcliffeborough these days, it's hard to believe that all of this used to be farmland just a couple hundred years ago, isn't it? Map of Radcliffeborough showing Coming's Creek. Halsey Map from the Preservation Society of Charleston. Another thing that's hard to believe (well, maybe not considering what some of our streets look like during King Tides and heavy rain--y'all look out this weekend!) is how much of the peninsula used to be natural bodies of water. Radcliffeborough used to be surrounded by Coming's Creek, which extended up to Elliottborough. Six lots of this tidal creekfront property were bought by Chancellor Benjamin Faneuil Dunkin, of the prominent Faneuil family of Boston, in 1823 after he relocated to Charleston due to friendships he forged at Harvard. 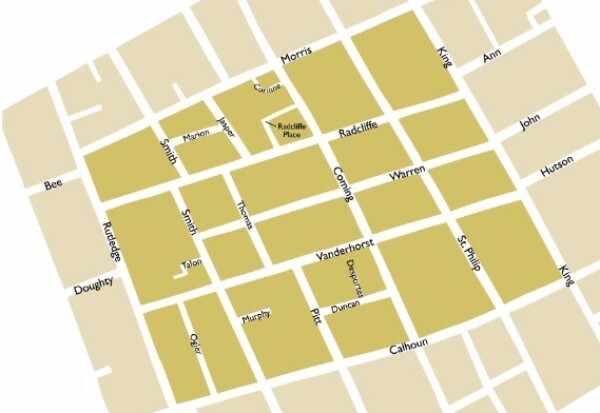 The lots were a square bounded by present Warren, Thomas, Vanderhorst and Smith Streets. He became Chancellor of the Equity Court of Appeals and after the Civil War was appointed Chief Justice of the S.C. Supreme Court. He also planted the Midway Plantation up on the Waccamaw Neck near Georgetown and built a 2 1/2 story Charleston single tenement to the east of his Warren Street residence at 13 Thomas Street. After his residence at 89 Warren Street (below in the early 20th century and today) was completed on the southeast corner of Warren and Smith Streets, he sold the three lots to the south with the provision that no buildings could be constructed in front of his house as long as he was living there, so that he could enjoy unobstructed views of and breezes from Coming's Creek. Sounds like Dunkin knew how to make a deal! 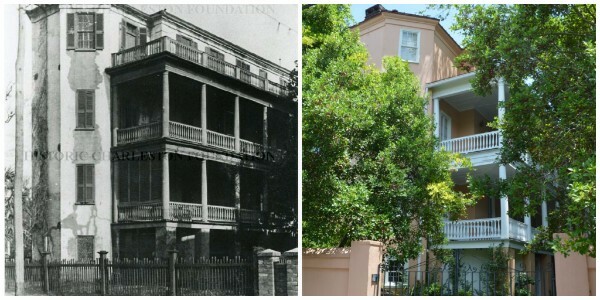 89 Warren Street in the early 20th century (left, Historic Charleston Foundation) and today. Dunkin lived at 89 Warren with his son until the 1870s. The grand home, like many others in Charleston, had declined to dilapidated conditions by the mid-1900s. A Do You Know Your Charleston article from 1968 described it so: "Here we find houses suspended in a rather curious state of not being one thing or another--too solid and handsome to seem like poor buildings, too fine in detail to be anything but lovely, yet debased by the tarnish of inattention so that many persons would call them slums, tenements, or places worthy of a wrecking crew's efforts." Thankfully, the property was rehabilitated in 1985 and restored during the 1990s. This four-story dwelling has large polygonal bays at the east and west ends of this long, Charleston single style home with tiers of piazzas on the south side. Might you or someone you know be interested in acquiring such a stately property? If so, give Lois a call at 843.270.2797 or shoot her an email at lois@loislaneproperties.com. Interested in properties for sale in this neighborhood? See what else is available in Radcliffeborough right now!